Toyota is following on from the success of the IQ Font campaign in Belgium with “iQ Street View”. 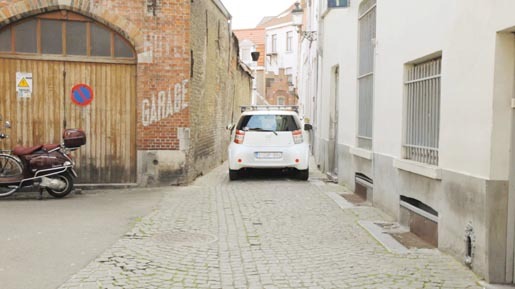 Toyota is completing the Google Street View picture of Belgium, started in 2011, by using Toyota’s iQ city car to film the tiniest roads and cul de sacs which were left out in the cyber cold when Google’s multi-eyed big cars went home. 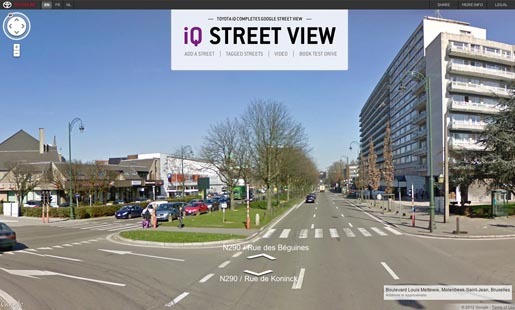 The data will be presented to Google at the end of this year to complete Belgium’s Street View. Toyota is asking people to tag streets that are not yet filmed by Google on www.iQstreetview.com. These streets must meet the iQ-criteria. Only streets that are difficult to navigate in will be considered. On the campaign website users can watch a video showing how iQ Street View works, tag their street, view which streets have been filmed by the iQ and book a test drive. To kick-start the project Toyota has already filmed a number of streets across several locations including Brussels, Mons and Tubize. 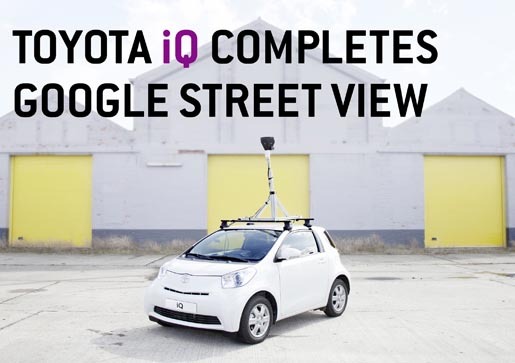 As prime candidates to own an iQ, people living in the newly tagged streets will be systematically receiving a direct mail from Toyota with an exclusive offer on the iQ and a note informing them that their street has been added to iQ Street View. The iQ Street View campaign was developed at Happiness Brussels by creative managers Peter Ampe, Isabel Peeters, concept providers Patrick Glorieux, Naim Baddich, head of art Cecilia Azcarate Isturiz, copywriter Patrick Glorieux, art director Naim Baddich, graphic designer Jeremy Vandenbosch, content director Joris Joosten, producer Bart Vande Maele, director Bob Jeusette, account director Pascal Kemajou, account manager Mehdi Sel, working with Toyota marketing team Patrice Vekemans and André Juprelle. The website was built at Bliss Interactive, Vietnam. Direct marketing was done at Redworks Brussels.